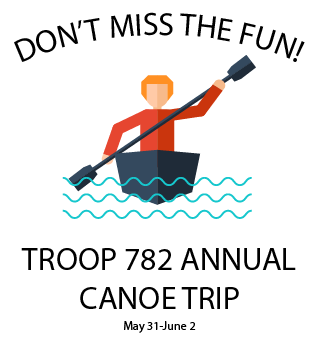 Troop 782 is a 62-year old Boy Scout troop based in Livonia, MI. Troop meetings are held every Monday night, 7:30pm to 9:00pm at Holy Trinity Lutheran Church, 39020 Five Mile Road, Livonia. We are proud of our 315 Eagle Scouts, and membership of 60 scouts and over 40 adult leaders. Our unit has an extensive First Year Program, with the focus being new boys who join Boy Scouting. We have four campouts throughout the year, specifically for First Year Scouts, as they learn about the program, and master basic scouting skills. This site keeps members and friends of Troop 782 up-to-date on the many planned events. Visitors who are interested in learning more about Troop 782 are free to explore this site and email any questions to the troop liaison. Canoe Trip – Families welcome! Stay up-to-date with all troop activities. To get on the troop email list, CLICK HERE! This site is © Copyright BSA Troop 782, Livonia, MI 2001-2019, All Rights Reserved.